Russia will have 271 athletes eligible to compete at the Rio Games, says the International Olympic Committee (IOC). This is more than two-thirds of their original entry list of 389 athletes, despite the World Anti-Doping Agency (Wada) recommending a blanket ban after a state-sponsored doping scandal. Russia's Olympic Committee president Alexander Zhukov said his country will have "the cleanest team" at the Games. The Olympics opening ceremony takes place on Friday. "The Russian team may have experienced the toughest checks of the Olympics, because they had to go through multiple tests and checked," said Zhukov. "On top of all that, Russian athletes are going through additional testing which is taking place at the Olympic Village. "So, as of now, the Russian team is probably the cleanest in Rio." Zhukov said it was a "flagrant injustice" that some Russian athletes would not be in Rio. He said: "Athletes such as Yelena Isinbayeva and Sergey Shubenkov who have never been associated with the issue of doping and who are absolutely clean cannot take part in the Olympics Games, but many sportsmen like, for example, the American runner Justin Gatlin, who have served doping bans, will." Isinbayeva won Olympic gold in the women's pole vault at London 2012 while Shubenkov is the world 110m hurdles champion. Will 271 be the final number? The IOC asked individual federations to decide whether Russians could compete after an independently commissioned Wada report found evidence of a four-year, state-run "doping programme". It said federations should not allow Russians to compete if there could be any doubt about their doping record - and that any athletes previously sanctioned should not be in Rio. A three-person IOC panel then ratified the governing bodies' decisions - and announced on Thursday that 271 athletes had satisfied its strict criteria. But the ROC says another five cases are still pending - three track cyclists, one wrestler and one canoeist. Additionally, the Court of Arbitration for Sport (Cas) has asked for the cases of another three athletes to be looked at again after they appealed against being banned. In partially upholding the appeals of rowers Anastasia Karabelshikova and Ivan Podshivalov, and swimmer Yulia Efimova, Cas said the IOC could legitimately block Russian athletes from competing if it had any doubt over whether they had ever doped. 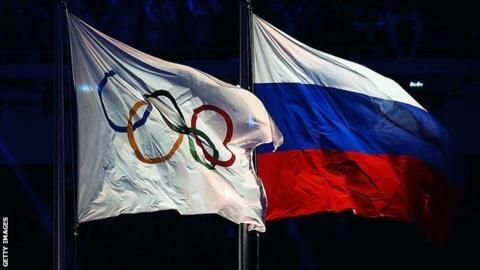 But it said the IOC was wrong to insist Russian athletes who had previously been sanctioned could not go to the Games, calling the decision "unenforceable". This supports an earlier Cas decision - known as the Osaka rule - which established athletes could not be punished twice for the same doping offence. And it means athletes banned from Rio because they have previously been sanctioned for doping could now challenge the decision to make them stay at home. Cas has already heard 18 cases since its division in Rio was opened on 26 July, a record for one Olympics.